If you stay at a Flagstaff hotel that is not on our list, you can meet the bus at another Flagstaff location. You should wear comfortable shoes, a hat to keep your head protected from the sun, sunglasses, and sunscreen. It may be cool in the early morning or evening and can get very hot in the afternoons. A light shirt, shorts and a rain jacket are recommended in warmer months. It does rain in Arizona so you may also want to carry an umbrella. Light day packs are great for carrying everything you will need and for filling up with all of the wonderful souvenirs that you will find at the many gift shops. Of course, don’t forget your camera with plenty of film. For those going on the Colorado River Rafting Adventure, please wear shoes that are ok to get wet. There will be an opportunity for swimming; swimsuits & towels are optional. Spring and Fall weather is extremely unpredictable. Be prepared for sudden changes in the weather during these seasons. Summer temperatures on the South Rim are relatively pleasant (50°s – 80°s F / 10°s – 20°s C). Inner canyon temperatures are often extreme. Daytime highs often exceed 100° F / 38° C. In the winter you can expect cold weather and possibly snow. Great West Adventure Co. reserves the right to charge up to full fare for no shows. If all or part of your party cancels with less than 48 hours notice you will not receive a refund (parties of 7 or less). Full refunds will be given for if Great West Adventure Co. is given more than 48 hours notice. There is a 48 hour cancellation policy for parties of 8 or more. If all or part of your party cancels with less than 48 hours notice you will not receive a refund. Full refunds will be given if Great West Adventure Co. is given more than 48 hours notice. Refunds will be given for cancelled tours due to extreme weather. No refunds for inclement weather during tour. Customers who miss their scheduled pickup will not receive a refund. Yes. We have a wheelchair on the bus at all times. Let us know if you may need it and we will reserve it for you. Yes. Our reservation page is a secure page. Your credit card information is safe. If you prefer to make your reservation on the telephone, be sure to let us know that you found us on the web and you will still receive the internet discount. If you have not already seen the Grand Canyon, then choose one of our Grand Canyon tours. 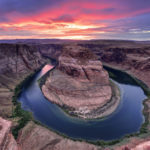 The Colorado River Rafting is above the Grand Canyon in Glen Canyon. 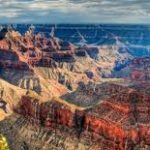 This tour focuses more broadly on the Northern Arizona area, whereas our Grand Canyon tours focus almost entirely on the Grand Canyon. You will not see the Grand Canyon from the rafting tour. The river rafting tour is a wonderful compliment to one of our Grand Canyon tours, and it’s a lot of fun! Plus, if you reserve both tours you will save 10% off of each tour!